How to assemble a drum kit out of buckets. Bucket drumming can be a wonderful alternative or option for many drummers who are just starting out, on a budget, or looking for a decent, portable kit to lug and play around with. One of the greatest things about drumming, is its adaptability. You can quite literally drum on anything anywhere. In this case, buckets. 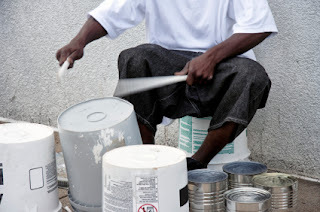 In this post, I'll explain how to build a decent drum kit for little-to-no cost out of buckets. As you read, just remember one thing: personalization is key. The Snare Quite possibly the most important part of any drum kit. For a snare drum, I'd recommend a 5 gallon plastic bucket. To give it a snare sound, place the bucket with the open-end facing up, and fill the bucket with about 50 pennies. Play the "snare" by striking the rim of the bucket. The pennies bouncing and rattling around will emulate a snare hit. Toms Essential for solos, and the easiest to replicate. Just place any bucket (5 gallon, 3 gallon, etc.) open-end downwards. I'd recommend a variety of buckets with different sizes so you can achieve different tones out of each bucket. Play these "Toms" by striking the center of the bottom of each bucket like you would on a real tom. You can place a bucket on your toe to lift up the bucket and get a bassier tone. Don't forget about the lip/rim on the bottom of the bucket! That also helps you achieve different sounds out of your toms. Bass Drum I don't have a bass on my bucket kit, so it'll be a little difficult for me to explain how to emulate one. I will, however, try my best. I'd recommend a big Rubbermaid bucket for a bass drum. Place the drum on its side in front of your right foot with the open-end facing away from your kit. Place a kick pedal in front of your bucket so you can play the drum by tapping your foot. Hi-hats Like real hi-hats, use a small cymbal for this. Place the cymbal on the ground under your left foot. Yes, UNDER your foot. Reach down to hit the cymbal, and use your foot to control it. Lift your foot to make an open hi-hat sound, and lower your foot to make a closed hi-hat sound. Cymbals, and Extra Effects Personally, I'd recommend using real cymbals and hardware. Don't be afraid experiment! Use a small metal coffee can as a cowbell. Use glass jars for unique chime tones. The possibilities are practically endless! All you need is the potential. Tips and Hints Rubber buckets give a softer attack with more bass, whereas plastic buckets give a sharper attack with more stick definition and treble. Smaller buckets give a higher pitch than bigger buckets. Stack buckets to raise small buckets. Step stools make good thrones because they sit low to the ground so you aren't constantly crouching over to play. This eases stress on your back. Arrangement It's all personal preference here. Try new arrangements until you find a setup that works best.